Below is some information and terms and conditions for swimmers on our swimming lesson programme. You should review these terms and conditions before embarking on swimming lessons with us. All our lessons are taught using the ASA National Plan for Teaching Swimming, in most of our lessons we have added an additional lifesaving element. All our lessons are delivered by qualified swimming teachers who are all DBS checked. All teachers are qualified to teach up to 20 swimmers of mixed ability, but we aim to teach lessons with a ratio of 1:4 for beginners, 1:8 for the higher level lessons, 1:16 for Stage 10, Rookie, Lifesaving & Phoenix Swimming Club. Refunds for lessons will only be given within 7 working days of making the booking. This will be subject to an administration fee of £10. BH&L will only offer refunds in form of a Cheque or Debit/ Credit Card. No cash refunds, other than one the day purchases can be actioned. For prolonged illness, for example a broken leg, requests for credits can be made at reception. Medical credit requests must be accompanied by a medical note issued by a medical professional. At the end of the week, to say thank you for helping to train the teachers we will give out sweets to the swimmers, usually in the form of fun size chocolate or jelly sweets. If you would prefer your child to not receive these then please let reception know. 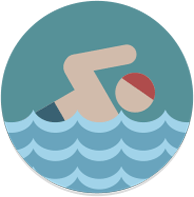 Although lessons may be different feedback from training crash course is always positive, with the swimmers enjoying the variety that the new teachers bring and all feedback will be greatly received, so if you have any questions, comments or queries please see reception at any time. Thanks again for helping us to train our teachers and we hope you enjoy your time with us.